Despite a kitchen or bathroom sink's durability and resistance to wear and tear, cracks are inevitable. Large cracks are typically difficult to repair and require replacing the entire sink. However, you can easily fix small or hairline cracks in porcelain sinks using repair compound, or cracks in ceramic sinks using epoxy adhesive. To conceal the patched section so it blends with the surrounding sink surface, you may need to tint the porcelain compound before application, or paint over the epoxy adhesive after application. Repair tiny cracks in your sink with repair compound or epoxy adhesive. Clean the surface of the sink thoroughly to remove accumulated scum and debris. Avoid scrubbing too hard as you may cause further chipping. Dry the sink with a soft towel. Smooth out the cracked surface of the porcelain sink with medium-grit emery cloth. Soak a cloth in rubbing alcohol and rub it over the prepared area. Let the alcohol evaporate completely. Prepare the repair compound according to the manufacturer's directions on a clean glass piece. 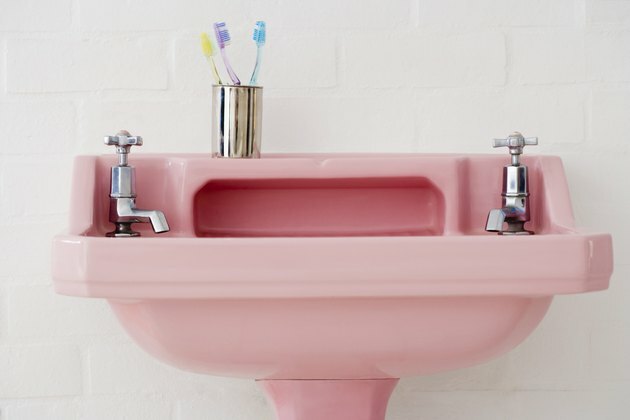 Add to the compound a small amount of high-gloss paint in the same shade as the porcelain sink. Do not add too much tint, but pour a little at a time, mixing the compound with a wood dowel until you achieve the desired shade. Scoop a small amount of the prepared compound with a blade and apply it over the crack. Press the compound into the crack to fill the void. Add more compound over the exposed surface of the crack. Overlap the edges of the crack with the compound. Scrape the excess repair compound with the edge of the blade to make it flush with the surrounding sink surface. Repeat this process for patching other cracks in the sink. Soak a cotton swab in nail polish remover and rub it over the edges of the repaired patch to remove excess compound when it dries. Doing this blends the repair compound edges with the surrounding porcelain surface. Let the repaired patch dry for the time specified on the label directions before using the sink. Wipe the surface of the ceramic sink clean to remove grime and grease. Dry the sink with a towel or cloth. Spread a bead of epoxy adhesive over the dried crack. Use a toothpick to push the epoxy into the crack. Wipe away excess epoxy surrounding the crack with the corner of a damp sponge. Work carefully so you do not wipe away the epoxy covering the crack. Let the epoxy dry for 24 hours. Apply a coat of paint that matches the tint of the sink over the repaired section. Allow the paint to dry according to the manufacturer's directions.